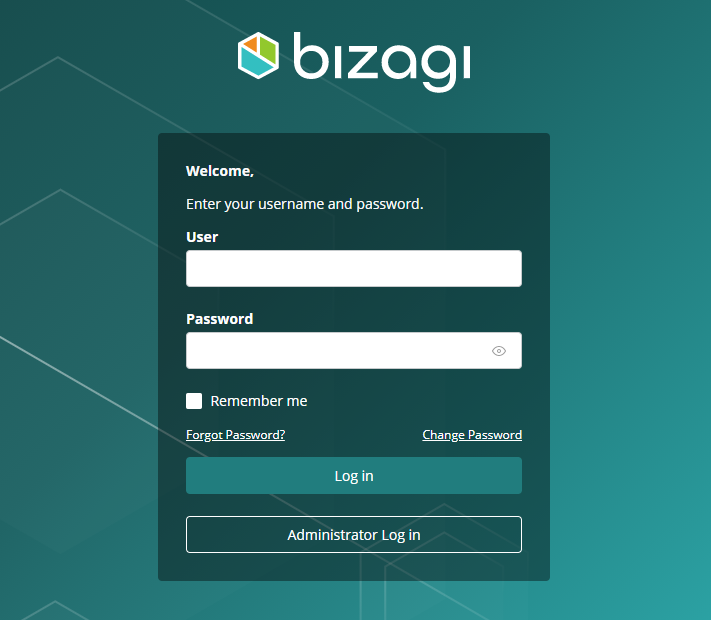 Bizagi presents a Work portal where the business applications that have been previously designed, are presented to end users. End users work in there in structured or unstructured processes, by creating new cases, completing pending activities, or overall working with the data of the designed business applications. As part of the Experience design concept, the Work portal features a new menu aimed at enabling Stakeholders to interact with Bizagi under a personalized experience; that is, by having the content adapt to each particular user. Bizagi is context-aware and will understand who the user is, and what the user wants and needs. End users only need a registered account in that Bizagi Work portal, and access through a browser (i.e, from a desktop), or from the Bizagi app when using mobile devices or tablets. Intranet or Internet access is needed according to how the production environment is set up in your organization. For further information about authenticated access to the Work portal, refer to Login to the Work portal. Bizagi Work Portal has a timeout session configured by default. Thirty seconds before the session ends, a warning message will display notifying that the session is about to expire. To keep the session opened you must click on the continue button. If any user exceeds the default time (20 minutes), a pop-up window will display indicating that the session has expired and the user must log in again. To log in again you should click on the log in button on the pop-up window. The session time is controlled per project, this, if you have more than a browser opened with the same project, all of them will display the same message. Thus, It is recommended for users to save the session frequently before it expires. To modify the session time out you must go to the Security module from Bizagi Studio Expert View, display the authentication options and select the idle session time out option. 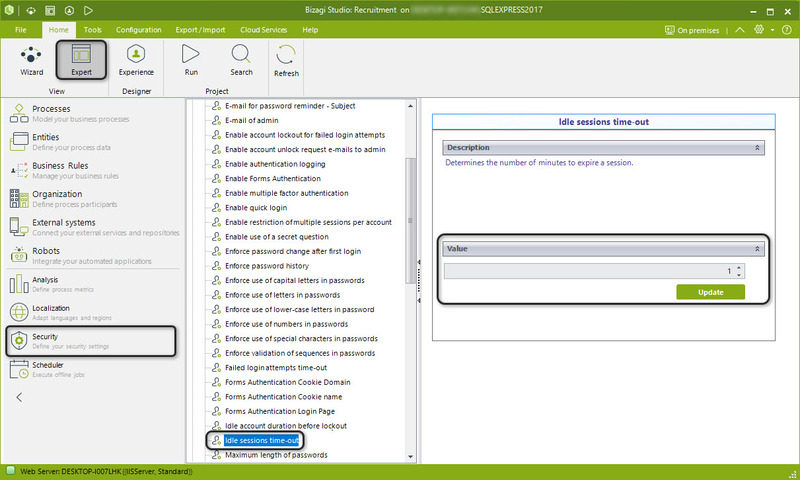 Once selected, a window will display where you will be able to set the session time out for Work Portal users. Select the Update button for the changes to be effective. For Bizagi Authentication Method, it is necessary to execute IISRESET once this field is modified. The Work portal presents different menus for different uses. Note that an admin may configure access rights so that not every profile has visibility and access of the complete set of menus. 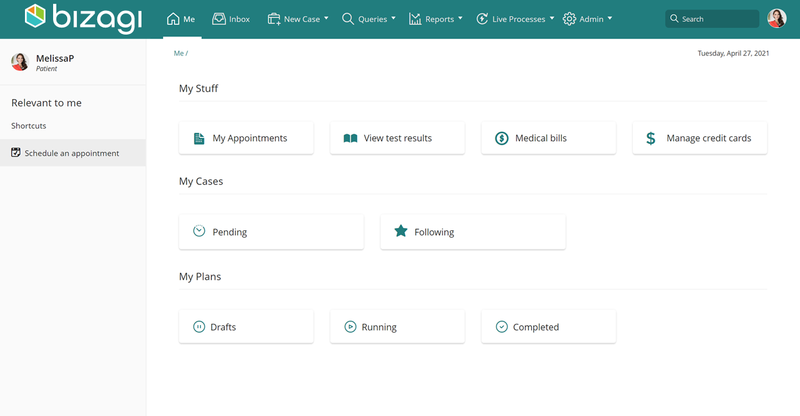 There are two main menus which are centered around enabling end users to complete their daily work, regarding structured or unstructured processes. 1.Me: A menu which dynamically adjusts to individual changes of the logged-in end user, which is classified as a Stakeholder. This menu is context-aware, and it presents the options and features that make sense to that Stakeholder while in a particular circumstance. For further information about the Me menu, refer to Me. 2.Inbox: Presents the activities which are pending and have been currently assigned to the logged-in end user, regardless it that user is a Stakeholder or not. For further information about the Inbox, refer to Inbox. 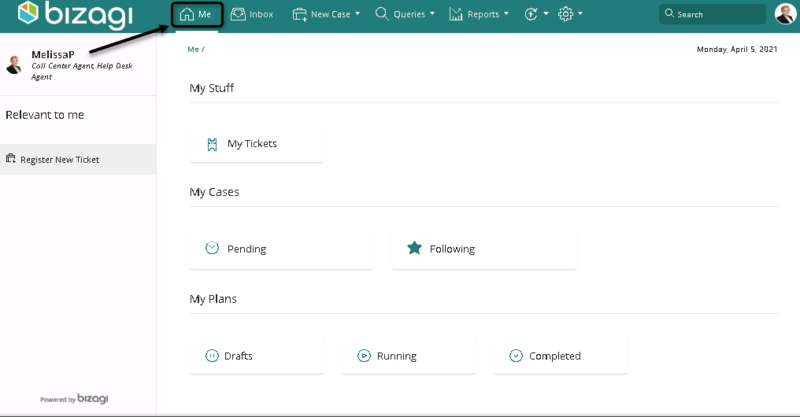 Additional options in Bizagi Work portal consider options for end users in general, but also for a upper management profiles, a business admin or a platform admin profile. •New case: An option to start new process instances (i.e, cases). Available processes to be manually started are presented by following the process hierarchy as defined for your organization's processes architecture. •Queries: A feature designed for management profiles to retrieve details of ongoing and closed cases, as well as business data stored in specific entities so that these search results are useful to create reports or analysis. For more information about this option, refer to Queries. •Reports: A comprehensive set of performance indicators for both real time and historical analysis. Observations and conclusions obtained from these indicators help analysts understand the process and identify opportunities for improvement. For more information about this feature, refer to Reports and Process Analytics. •Work portal administration: A comprehensive set of options to manage the Bizagi project as a whole. The project encompasses the unlimited number of process applications you may have, as well as aspects of the system in general such as parameters, business definitions, system settings and users, among others. For more information about this feature, refer to Work portal administration.